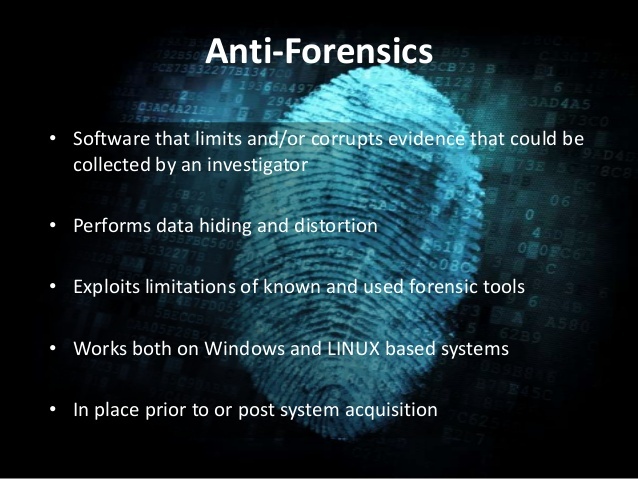 This article will teach you everything you need to know about anti-forensics to protect you and your privacy alike , with that being said,let’s get started. Using time stamps , forensic experts can build a ‘digital time-line’, this can be very compelling evidence when cross-reference with other known evidence. In order to strengthen security , we must disable these logs. You should see two sub keys called Count . delete both these keys. Now right-click the USERASSIST key and create a new key named Settings. In this key create DWORD value named NoLog set the value 1.Windows will no longer store logs of your activity. Next we will disable the last access in windows. What last access is ,is a setting on windows that allows you to see when you opened , modified , and /or created files on your computer and is similar to the UserAssist registry key. By disabling this ,forensic experts won’t easily be able to tell when you’ve accessed programs or files on your computer. To disable last access , open command prompt on your computer , if on vista or windows 7 make sure to run as administrator. In command prompt type the following. Last access has now been disabled , in order for it to take effect you must restart your computer. It is very important to make sure that your computer is encrypted in the case an unwanted visitor is trying to get access to your computer , they will not be able to get access to your computer if it’s encrypted. To encrypt your computer , you can use TrueCrypt , a free program that allow you to encrypt your computer. When encrypting with TrueCrypt , you have two options ; the first one is to create a hidden container. A hidden container is an operating system that is impossible to prove that it exists. 1.1 The first would be for your decoy system , the operating system you would show someone forcing you to login your computer. The second option is to just encrypt your hard drive . This is also very secure , but you ma be forced to give up your password due to court-order in this situation many would think to simply say that they forgot their password , but doing so could get you held in contempt of court. With normal drive encryption you computer is just as secure , encryption wise, and you will have a single password. It is imperative that you protect yourself from keyloggers , hackers will use these steal log-in information and credit cards , the government uses keyloggers to spy on you. Encrypting you keystrokes is an excellent technique to protect yourself from keyloggers , it renders any tracking of typed keystrokes completely useless. Keyscrambler is a program which can do just that , encrypting all keystrokes sent to a variety of popular applications , its premium version supports 170+ programs , though it is not free and costs a hefty $45 , you can alternatively use the free version , but it is obsolete when compared to the premium. Encryption is pointless if it can be easily bypassed or overcome . You need to make sure that the encryption is secure too. Even with your computer encrypted , it is still vulnerable. Make sure your password is good ( for ideal security , your password should be twenty or more characters , with symbols , numbers and random capitals , and a special symbol. If your password is not strong enough , you can change it by right clicking your encrypted drive in TrueCrypt and selecting ‘Change Password’. Encryption is point less if the fedds get to your computer while its running. They can use live forensic tools that don’t need the movement or shutdown of a computer. A very simple technique to overcome this is to create a locked screen saver. very good, but quality comes with a price-tag and you might find them a bit too expensive for your taste. Next on the list of Anti-forensics is to disable logs of USB activity , flash drives etc.. This can be valuable if you have a flashdrive with sensitive data and you don’t want any logs of it ever being plugged in to your computer. In your registry there is a key called USBSTOR , which logs all information on USB devices interpreted by your computer; brand name and model , size of the device , date and time plugged in etc. Forensic experts can and wil use this to match your computer to USB devices. Deleting this registry key is not as simple as most otheres , it has special permissions that can be hard to bypass. To delete this key, we will use a tool from Microsoft called PsExec , you can download it here. The setupapi.log is a plain-text file that stores the list of installed USB devices and their drivers. We will delete it with a program called CCleaner. CCleaner is actually one of the best tools that anti-forensic has to offer, it does a great job of securely wiping files for specific instructions. This section is for various information that is important to anti-forensics , but isn’t quite big enough to have its own section within the article. System Restore Points can be used to bring your computer back to a date when it wasnt secure and can also be used to restore overwritten files.To disable system restore point right click Computer and click Properties now click Advanced system Settings. Under System Protection click Configure.Now select Turn off system Protection and apply it. This is self explanatory , we obviously don’t want Microsoft to have all of our logs/ crashed programs. To do this , go to start menu and search problem reporting settings and then click on Choose how to report problems, click ‘ Change Report Settings for all users and then set it to Never check for solutions. Once you have CCleaner installed , run it as administrator , go to settings and make sure you have it set to overwrite deleted data with three passes. Go back to CCleaner and check everything then hit Run Cleaner. You might want to leave this on overnight depending on how many files it has to clean. Do this every time you are done with a major hacking job. When using CCleaner normally (what should be every time you are done with your computer) uncheck Wipe Free Space , this will cut down the time from hours to a few minutes. To disable it , right click Computer and go to Advanced System Settings , now go to Start Up and Recovery. Now set Debugging Information to NONE. Windows keeps logs of all events on the computer. First , before we disable , we must clear all the logs.To disable it , go to control panel , then System and Security. Now , click administrative Tools and then Event Viewer. In either pane of the Event Viewer window, right click System and then select Clear All Events , click no to the dialog box that will open. is unchecked. Now scroll down until you find ‘Windows Event Logging’ and uncheck it. Restart your computer right away. You may as well hand your computer over to the feds if they raid your house and your computer is in hibernation. Also , putting your computer into hibernation is pretty much taking a screen shot of your RAM that gets saved to your hard drive. Open control panel. Click System an Security, then click ‘Power Options’ Click ‘change plan settings’ for your current power plan. Now click Change advanced power settings. Expand Sleep, then expand hibernate after. Enter 0 for Setting. Hibernation is now disabled. Hope that explains everything in detail as to how easily the feds/forensic experts can bust you. Stay safe and anonymous , leave no trace! !